For the most part, Ford had a good year in 2015. But its road had some bumps worth noting. F data by YCharts. 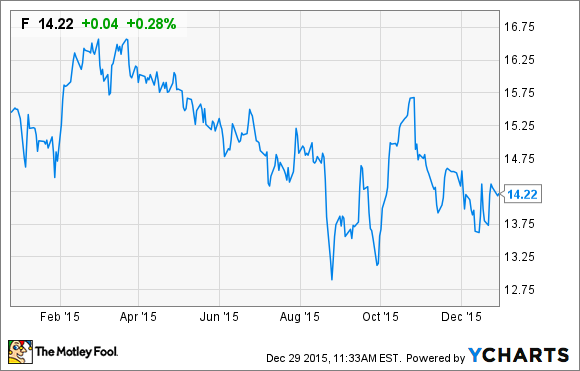 Ford's stock had a tough year in 2015. But its business went pretty much according to plan. Ford enters 2016 in good shape. It's solidly profitable, its truck and SUV factories are humming along, it has a new (and not onerous) contract with the United Auto Workers, and CEO Mark Fields may be on the verge of announcing a major deal with Alphabet's Google self-driving cars unit. But the road that Ford traveled wasn't without bumps in 2015. Here are a few of the most notable stories that caught our attention here at The Motley Fool. Ford's F-Series pickup family is the best-selling vehicle line in the U.S., and has been for many years. About 70%, give or take, of the F-Series trucks sold by Ford are F-150s. That's a lot of trucks, and the scale made Ford's efforts to change over to a dramatically new model for 2015 exceptionally complicated. Why so complicated? As I'm sure you've heard by now, the new F-150 has aluminum body panels. The year 2015 opened with a report from the sales front: Short F-150 supplies meant that Ford's chief pickup rivals, General Motors (NYSE:GM) and Fiat Chrysler (NYSE:FCAU), were able to gain ground in December of 2014. The F-Series is almost certainly Ford's most-profitable product line, by far. The drop in sales, plus the high costs of getting those factories set up, set the stage for a tough fourth-quarter earnings report for the Blue Oval. Ford's second-quarter earnings were also a bit light, falling short of Wall Street estimates because of a couple of factors. The continuing shortages of the F-150 were a big part of the story, as were some unfavorable exchange-rate swings as the U.S. dollar gained value versus many foreign currencies. Things turned up for Ford from there, for the most part. Ford's third-quarter earnings were much stronger, as F-150 supplies got back to normal, and it looks set to gain back much of the market-share ground it lost to FCA and (especially) GM during the transition. A report that Ford is likely to move production of the next-generation Focus out of the U.S. wasn't actually bad news for the Blue Oval: The Michigan factory that makes the Focus now likely will get more profitable products in the future. But some news outlets and political candidates tried to make hay out of the idea that Ford will "move jobs to Mexico." It isn't really true, but it didn't help Ford. ...but it passed by a slim margin after UAW leaders made a big push at Ford's Dearborn Truck Plant, the last big Ford facility to vote on the deal. It's a decent deal for both sides. Workers get raises and bonuses, and Ford was able to keep costs from escalating significantly. Last but (perhaps!) not least, a headline that didn't even mention Ford. This could turn out to be the toughest news of all for the Blue Oval in 2015, but it will be at least several years before we know for sure.